I’m not sure that this sermon is actually ready to preach. I’m still trying to get my head around it myself, so I apologise if it doesn’t really make things much clearer. But you see, in the church calendar, today is “Christ the King” Sunday which, as you heard in our gospel reading, is a day when the idea of calling Jesus our king is juxtaposed against the images of the ways political power is wielded in the world we live in. Not only did we just have a state election yesterday, thrusting issues of political power very much into our consciousness, but the last couple of years have seen all sorts of political upheaval with a whole new generation of aggressive muscular politicians emerging and upending the accepted orthodoxies of how politics works. So my challenge today is to try to make some sort of sense of what all that means and what the good news of Jesus has to say in the face of it. And I’m not sure that I’m ready. I’ll give it my best shot, and I’d love to hear back from you afterwards so that you can help me to push further down the track of understanding. Two things struck me as I reflected on today’s gospel reading in light of the politics of today. The first was the question of the relationship of Jesus’s kingdom to nationalist agendas. When Jesus says that his kingdom is not from this world, he is responding to Governor Pilate saying, “Your own nation has handed you over to me.” So if Jesus is responding to a question of his relationship to the nation, what does his answer have to say to those of us who would follow him about our relationship with nations? The second thing was what Jesus says about truth. “I came into the world to testify to the truth. Everyone who belongs to the truth listens to my voice.” We missed Pilate’s reply in tonight’s reading, but one more verse and we’d have heard Pilate say, “Truth! What is truth? !” And it struck me that maybe using the idea of fake news as a political tool is not so new at all. So what is Jesus saying to us in an era of renewed fake news? The most surprising thing about the outcome of yesterday’s state election was how ordinary it was. Given the trends in world politics recently, this election has been particularly notable for the fact that extremist candidates didn’t seem to get any traction or gain any ground. Of course we don’t have any upper house results yet, and weird preference deals will probably mean that we end up with an oddball or two, but even then it is not because the voters jumped on board with them. There are a couple who are likely to make it into the upper house if they got even just 0.3% of the vote, so their contrived success will not indicate any sort of popularity with the voters. In an era when politics around the world seems to becoming more and more bizarre and more and more extreme, we Victorians might be tempted to pat ourselves on the back this morning and congratulate ourselves on not joining the stampede down that pathway. We mostly stuck with the two established parties, and the one that most flirted with scare campaigns about migrants and crime was rejected by the voters in larger numbers than any poll had predicted. The result suggests that here in Victoria, we are not feeling angry and frightened and disconnected and vengeful and thus susceptible to macho politicians who want to fan those flames. Even if you’re a Liberal party supporter, that much is probably still good news for the future. So we Victorians might be feeling terribly superior about ourselves today. But then, if we are, we might be falling into the alt-right nationalist trap after all. It starts with a need to assert our own superiority. When Governor Pilate interrogated Jesus, questions of national interest were at the heart of the interrogation. “Are you the King of the Jewish nation?” was his first question. Pilate was the Roman governor with responsibility for making sure that the Jewish nation didn’t try to reassert its national independence and break out from under the rule of Rome. So any oddball who emerged as a new Jewish nationalist leader needed to kept under control. Either they pledged their allegiance to the status quo of Roman rule, or they were eliminated. How does Jesus reply? “My kingdom is not from this world.” Note that he does say that it is not in this world or that it is not for this world. He says it is not from this world, and he illustrates the distinction he is making by pointing out that his followers are not taking up arms to fight for him. Now there are all sorts of ways that I might go in preaching on these words of Jesus, but in light of so much of modern politics, I want to focus in on the fact that Jesus explicitly rejects the nationalist agenda when he speaks of his own kingdom. This is particularly important because many of the new macho politicians are claiming some sort of alliance with Christianity in their nationalist agendas. The French President, Emmanuel Macron, hit back in an Armistice day speech describing nationalism as one of the “old demons” that plunge the world into horrific wars. He’s right, but there is a strong nationalist movement on the rise in his own country. But calls to make America great, or make Australia great, or make Britain independent again, are unashamedly nationalist. They claim a virtue in asserting the superiority and interests of our little spot and its people over the interests of the rest of the world. It’s an agenda that Jesus wants nothing to do with. When asked to clarify who is the neighbour we are called to love, Jesus replied with a story that cast in the role of the ideal neighbour one who belonged to a tribe regarded as a national enemy. “Love your enemies,” he said. You probably haven’t heard any of these nationalist leaders repeating that call to love our enemies. A kingdom that is not from this world, that is instead grounded in loving our enemies, is not a kingdom that is going to ruthlessly patrol its borders and constantly fan the flames of fear of “illegal” immigrants or ethnic gangs. Demonising others does work as a way of fuelling nationalist sentiments and unifying people by focussing their anger and energy on a common enemy, but it is not an agenda that receives any oxygen from Jesus. Which brings me to the question of fake news. We hear a lot about fake news these days, but there are actually two quite different phenomena that attract this label. Related, but different. Political leaders increasingly dismiss inconvenient news as fake news. If climate change is fake news, then we don’t need to come up with a solution to it. Even journalists on Donald Trump’s favourite Fox News have begun telling him that news isn’t fake just because he doesn’t like it. But there is also genuinely fake news, that is used as a political tool. 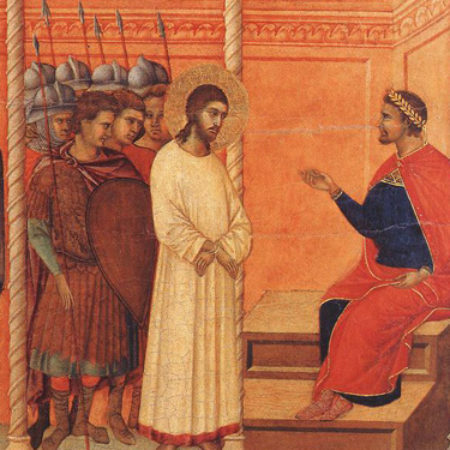 “What is truth?” asked Pilate. The implication being that truth is whatever I say it is, and it’s backed up from the sheath of a sword or the barrel of a gun. When Jamal Khashoggi was murdered in a Saudi embassy, the Saudis put out four completely different explanations within the first weeks or so. Apparently this is a common fake news tactic now. It causes confusion so that although no one really believes any of it, they quickly lose track of what it is they are not believing and just give up. “What is truth?” The truth is that even murder will be overlooked if our national interests require maintaining business with the perpetrators. The label “fake news” might be new, but the tactic and the practice are not. Pilate knew all about them when he sneeringly dismissed Jesus’s claim to have come into the world to testify to the truth. But Jesus’s words still sound a challenge to us as we consider our political positions. “Everyone who belongs to the truth listens to my voice.” Not the voice of Caesar. Not the voice of the President, or of this week’s Prime Minister. Not the voice of those who try to stir up fear with spurious allegations about the Safe Schools program or safe injecting rooms or African youth. “Everyone who belongs to the truth listens to my voice,” and the boundaries or interests of individual nations have nothing to do with it. But however much fake news nationalists generate and fuel, there is a truth behind their rise that we need to hear. That “we” could be either we Victorians who are feeling a bit better about the state of liberal democracy today because our election results are so conventionally mainstream, or we followers of Jesus who have long assumed that progressive liberal democracy was as close to the kingdom of God as worldly politics could get. We need to hear the truth that the reason that aggressive nationalist agendas are on the rise in so much of the world is because liberal democracy has failed so many people so spectacularly. Most of us have trouble seeing that, because most of us are not among its victims. But the truth is that decades of liberal democratic rule across much of the world has done very little end the massive inequalities that favour “us” at the expense of “them”. Even within developed Western countries like Australia and the USA, there is an increasingly angry working class being left behind by automation, off-shoring, and an era of ever increasing income inequality. And dismissing them as “deplorables” only unmasks the arrogance of a liberal ruling class that never thought for a moment that these people should be listened to and taken seriously. The growing anger and violence of nationalist and chauvinist groups like the Proud Boys and the United Patriots is a mirror image of jihadist groups like ISIS. The anger is fuelled by their constant exposure to images of successful western affluence, but their systematic exclusion from it. A hundred years ago, they’d have rallied around communism, but today’s excluded and oppressed masses are even less hopeful of being able to build a new world and so settle for simply smashing up the old one in their rage. Where am I going with all this? I don’t know. I’m a bit lost myself. But Christ the King Sunday is calling us to pledge our allegiance to following Jesus as our leader. And just as the gospel story itself makes it clear that Jesus is no ally of macho nationalist politics, so too the failure of our cherished liberal democratic project to take the needs of the poor as seriously as the needs of political and trade stability reveals that it has got us little closer to Jesus’s kingdom of truth and all-inclusive love and care. Politics as we know it is not going to be our saviour. But the hell from which Jesus comes to save us includes the hell that fuels all this political chaos. Jesus comes to save us from our self-destructive hostilities and resentments and racisms and sexisms and elitisms and nationalisms, and from the spiral of conflicts and fears that they plunge us into. And if we are to partner with Jesus in working this salvation on the earth, it will mean following him in his approach. That means renouncing the ways of the kingdoms of this world that take up arms and fight, and instead being willing to stand before the cynical purveyors of fake news, and witnessing to the truth of God’s all-inclusive love and care. And it means standing before the wielders of power who demand our allegiance to nation or tribe or class or even religious brand, and boldly declaring that our only allegiance is to an entirely different kind of kingdom that has no borders and no identity grounded in accidents of ethnicity or opportunity or origin. And it means gathering here around this table and being nourished for the journey through troubled times by the self-giving of a very different kind of king who rather than constantly assert his own greatness, lays down his life for the love of us all.